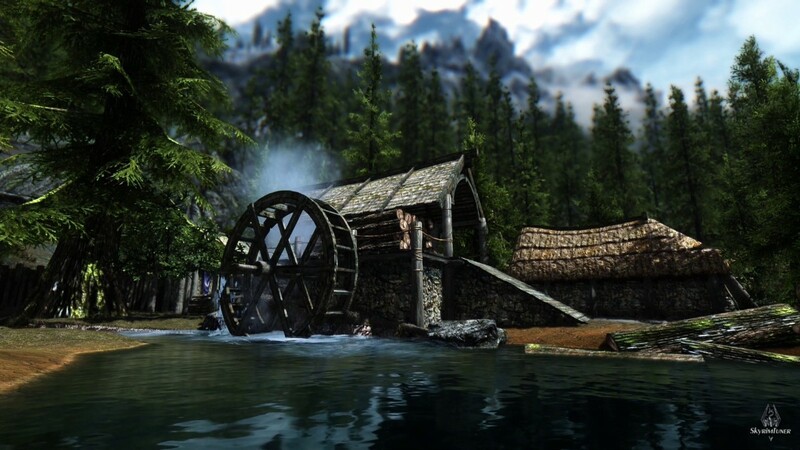 If you are like me, you love to play Elder Scrolls V Skyrim with loads of wonderful mods installed. Although mods add so much to the game, they can also cause your game to crash. This hub came out of my frustration at my game crashing and also the lack of any guide on the internet that helps you to find out why the crashes are happening. Broadly speaking, there are three times that Skyrim can or will crash. If you are new to mods in Skyrim, there are two main ways of installing mods. The first is by using a Mod Manager. 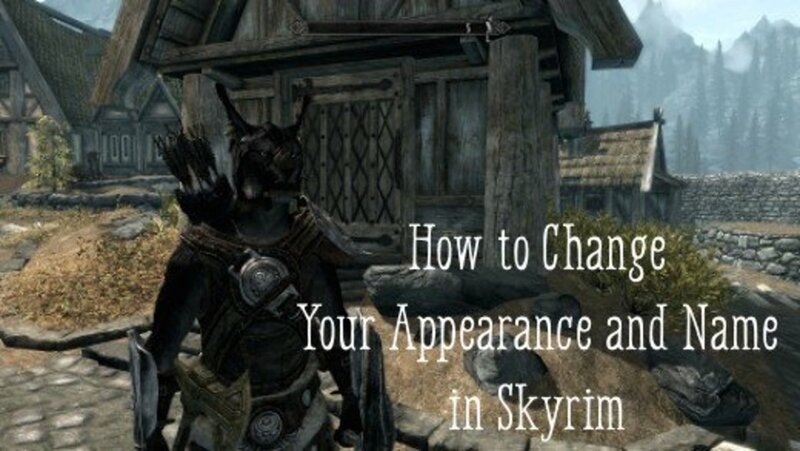 There are two main applications to choose from for Skyrim. 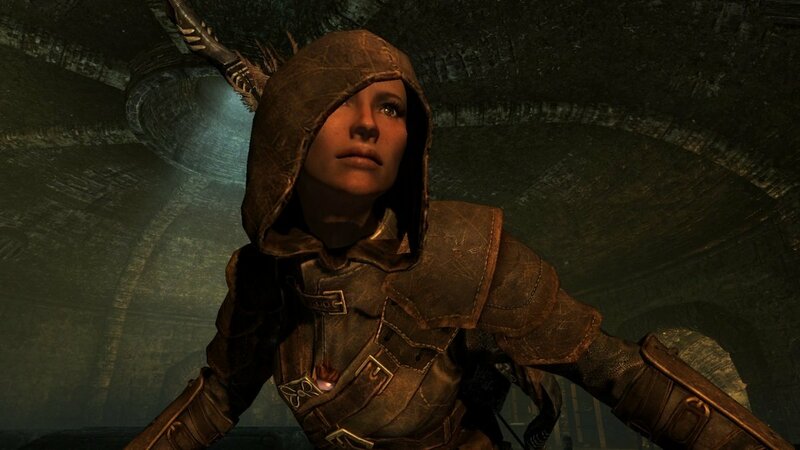 BOSS is an excellent tool which will perform a number of crucial checks on your installed mods in Skyrim. I recommend that anyone who installs mods uses this tool to enhance game stability and reduce errors and issues introduced via mods. However good a tool like BOSS is and believe me, BOSS is a tool that you simply cannot live without if you use mods in Skyrim, it is not foolproof. You can see from my picture below, BOSS has no warnings, advise or notes regarding any potential issues. 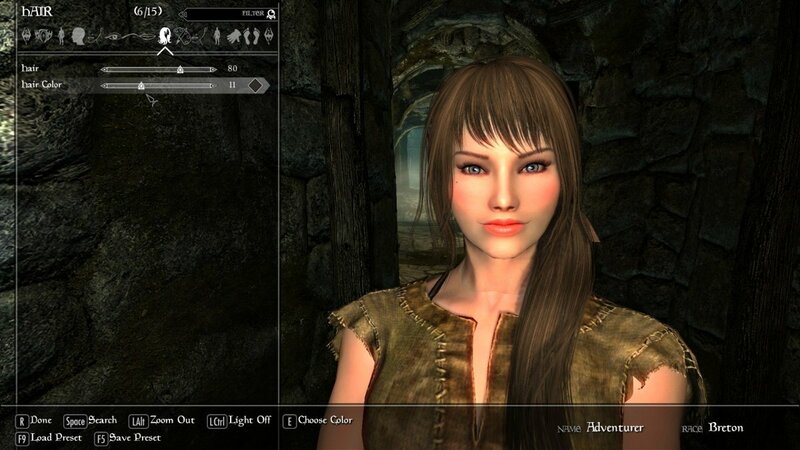 The mod that I suspect to be the culprit, Skyrim Unbound does not show any warnings. BOSS will not always tell you the cause of your Skyrim crashes. This means that BOSS does not have any information in its database to suggest that anything is wrong with my installation. The first step in identifying the cause of any game crashes is to enable logging, so that Skyrim will tell you exactly what happens before the game crashes. By looking at what is happening to cause the crash, we can then determine which mod is causing the crash itself. 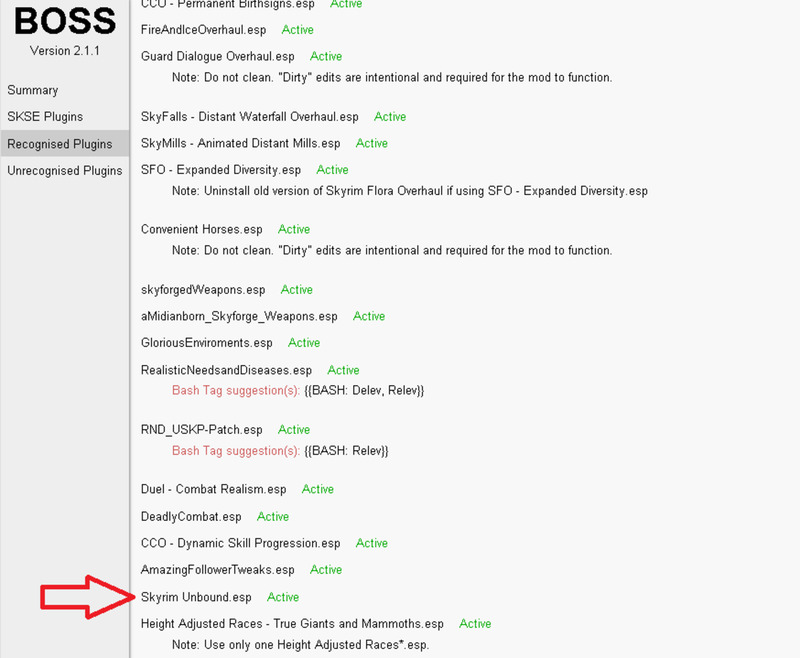 To enable logging, we need to edit your Skyrim.ini file. Important: Always back your ini files up before making changes so you can easily roll back if you have issues. Now, the next time your game crashes, you will see that Skyrim has created a new folder called Logs and a folder inside Logs, called Script. 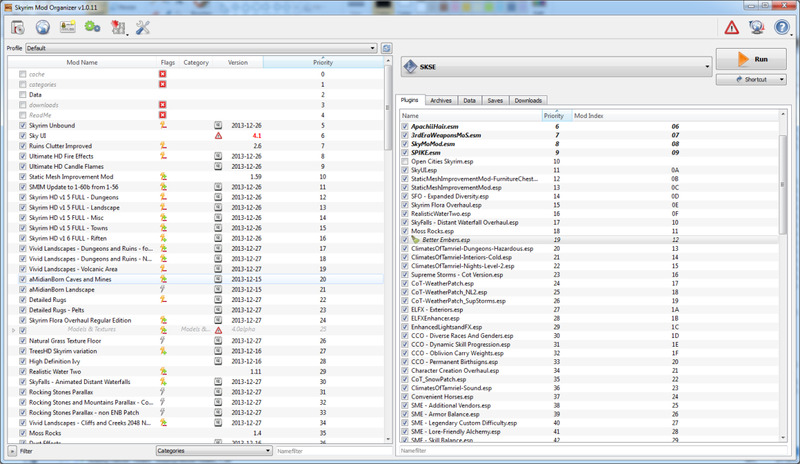 The Script folder will contain your crash logs. 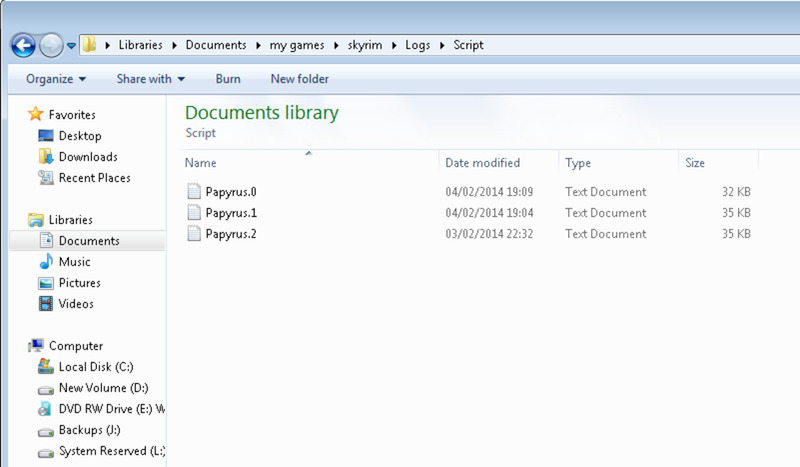 Open the log file which has a time that matches when your game most recently crashed (in my case it is Papyrus.0). Now, scroll to the bottom of the file and you will see what happened immediately before the crash. It is not too readable in its current format. To make it more readable, I found the most recent time stamps in the file (for example [02/04/2014 - 07:09:14 PM]) and put them on different lines. 02/04/2014 - 07:09:14PM] Error: File "Dragonborn.esp" does not exist or is not currently loaded. Looking at that last section, I can instantly spot a problem! I have over 100 mods installed, but I do not have Dragonborn installed. So a mod is looking for another mod that I don’t have installed. Looks like we are getting somewhere! Now we have to find out what mod that is. So we now know that Skyrim Unbound is looking for the Dragon Born DLC in a script called SkyrimUnboundMCMScript.psc on Line 115 and that this is causing my game to crash. I have highlighted the lines from the Papyrus log in green below. We also need to use a free tool called Windows Grep to confirm which file is causing the crashes. This excellent utility looks inside files for a specific string of characters. It is particularly useful if you don’t know which mod is causing the crash, or the Papyrus crash logs don’t give you a meaningful mod name. 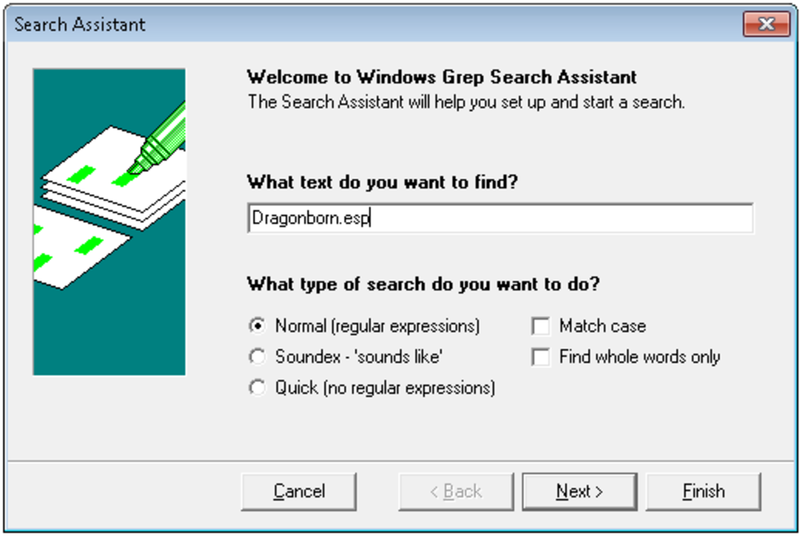 In this case, we are going to use Windows Grep to find out which mods reference dragonborn.esp. As I don’t have it installed and have avoided downloading mods that require it to run, I would expect it to not find it mentioned in any mods at all. 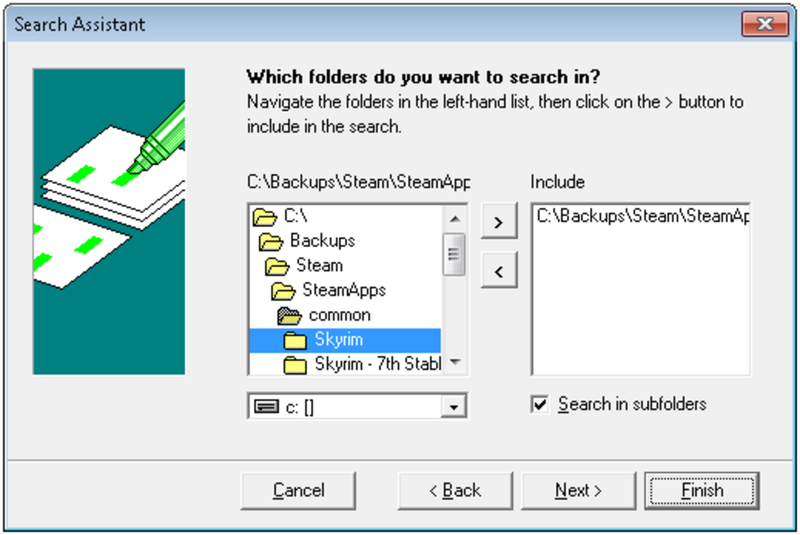 Windows Grep needs to know where to look, so browse to your Skyrim install folder and click the > to load it to the right hand panel. *.bsa, . *.bsl, *.esp and *.psc files. 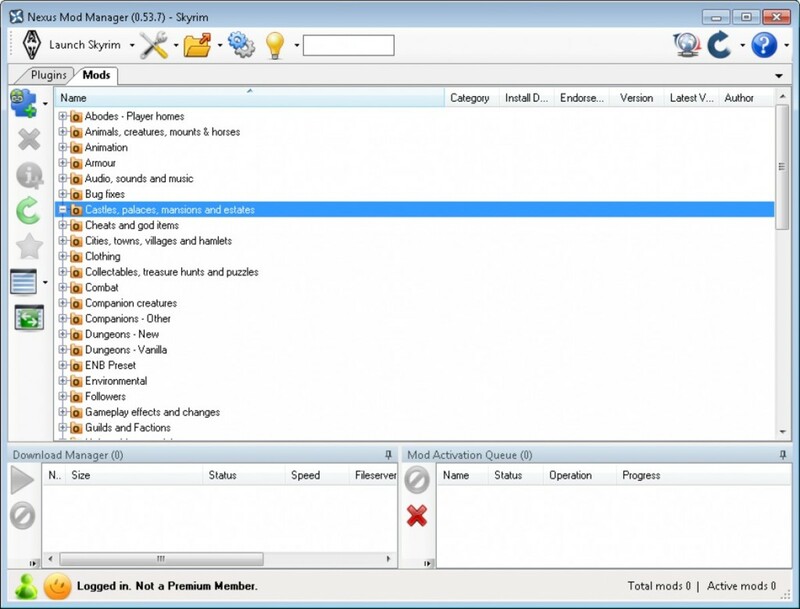 Those file extensions are the main extensions used for Syrim mods and scripts. 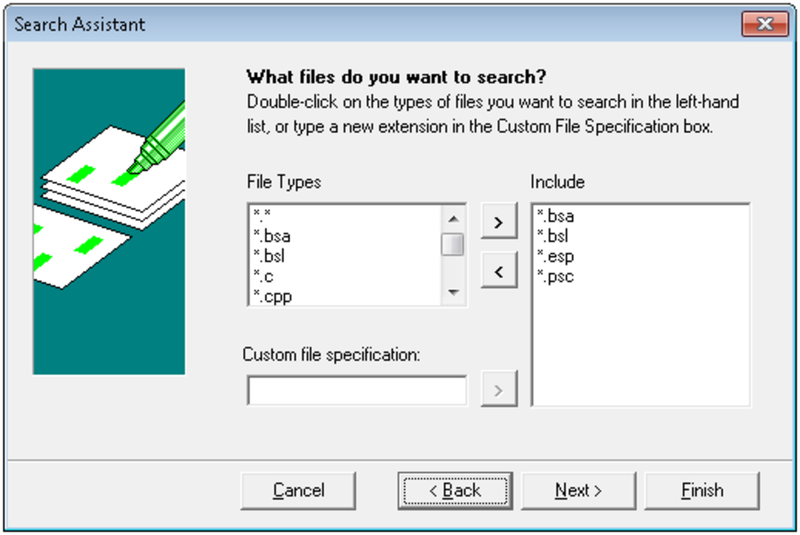 Windows Grep will now search all file types you specified for the string you asked it to look for. After a period of time, it will come back with the results. You can see above, that Windows Grep has found only one instances of dragonborn.esp in any mod or script installed and it is Skyrim Unbound.bsa. This confirms what we believed after reading the Papyrus crash logs. You can also look inside the actual file itself and check for instances of the string of characters you are interested in by clicking on the link to the file (illustrated by the red arrow in the figure above) and doing a find. Now that I have confirmation of the issue causing Skyrim to crash, I have two options. I can either purchase the Dragon Born DLC or remove Skyrim Unbound (I cannot live without Skyrim Unbound so I bought Dragon Born). Game crashes are an extremely annoying, but sadly frequent downside to playing Bethesda’s Elder Scrolls series especially if you install large numbers of mods like I do. 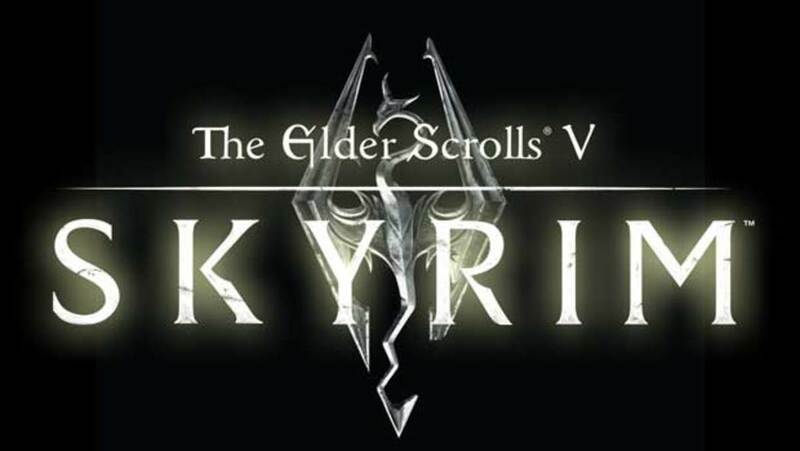 Skyrim, although a stable game overall, is no exception to this rule. There is no default logging as there is in Morrowind for example (it used a Warnings file to notify you of mod related issues) while the game is loading. Using this method of crash investigation, I was able to determine why my installation of Skyrim was crashing and which mod was causing it. 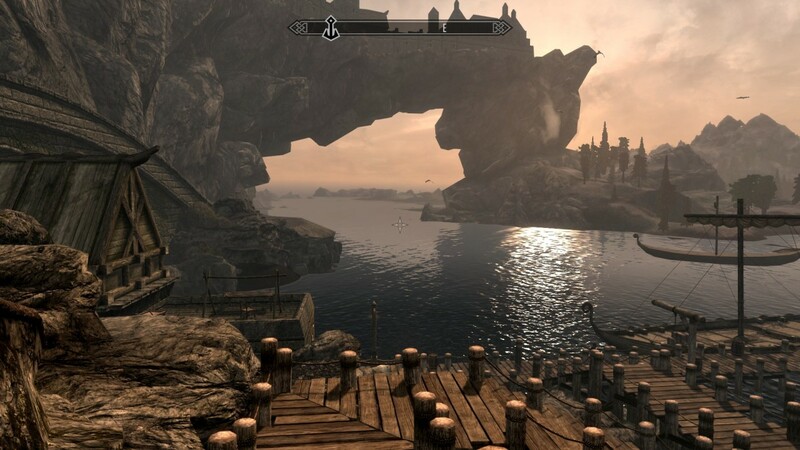 I hope that should you have a crash that you couldn't prevent that my hub has helped you figure it out and that you are enjoying (like me) spending a great deal of time happily exploring the wonderful world that is Skyrim. 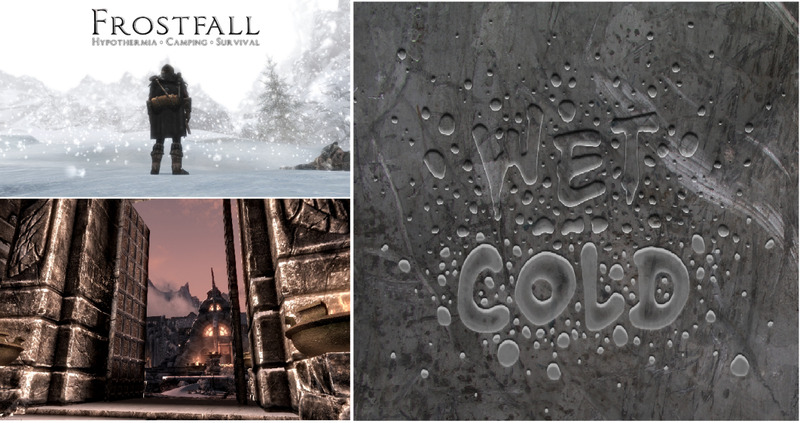 Which type of Skyrim crashes do you have most often? We need a mod that imitate the gopnik squat. It keeps crashing at the same location every time, in the Dragon Rising quest. So what you're saying is, we need to go to war with Russia? @luke or anybody having an issue where the game crashes when they are playing: it's a memory issue. Look into SSME, it solves the problem. Needless to say, this guide is hopelessly outdated and incorrect even when it was first released. First of all, BOSS is completely outdated and is no longer supported. All of the BOSS devs have either quit or moved over to LOOT development. Use LOOT. Second of all, Papyrus is NOT a crash debugging tool. It was meant to be a SCRIPT debugging tool, so unless you are a modder trying to debug your own scripts, you should not even have Papyrus logging enabled. 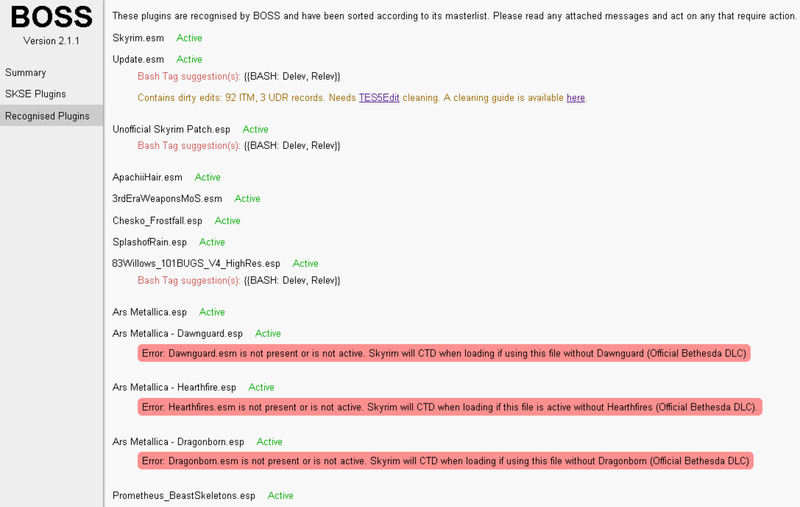 In fact, enabling Papyrus logging causes more strain on your game and increases the amount of CTDs. I can't do this because I'm a console gamer, it's crashes on my Xbox One... Is there another way to find out? Try opening the papyrus log in wordpad. Every timestamp is automatically placed on a new line. Saves a lot of work! Just followed step one of edit Skyrim.ini. Played Skyrim and waited for the inevitable crash and checked out the logs. And no scripts. 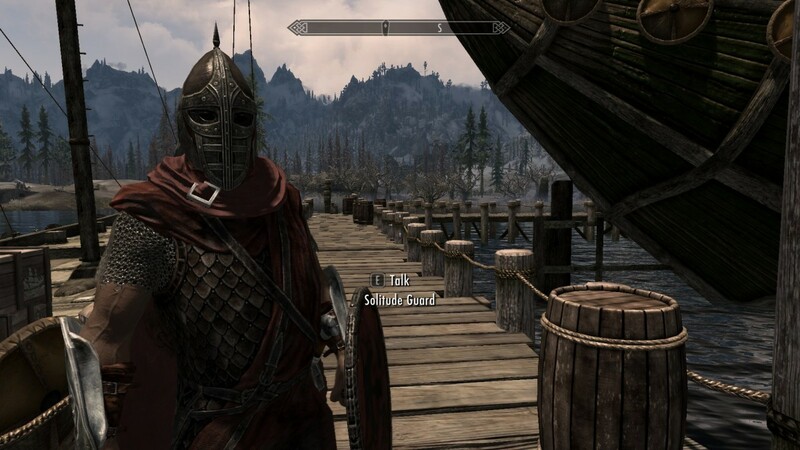 "Broadly speaking, there are three times that Skyrim can or will crash. Upon leaving a shop or a house"
BOSS is deprecated and the masterlist hasn't been updated for a few years. It was replaced by LOOT which is much more reliable and updated regularly. BOSS no longer works with Skyrim could you update this please. Isn't BOSS outdated? LOOT is the successor of it. BOSS is extremely out of date and you shouldn't use the Papyrus log to determine crashes, but the mod 'Crash Fixes'.